Michel Lylvieve is a Breton farmer living in Dragon Bridge with her husband Azzada, son Clinton, and daughter Julienne. When you talk to her she may give you some advice and tell you that "If you're looking for a room, you want the Four Shields." She will also be quick to comment on the life you have led with remarks such as "You look like you've seen your share of adventure." and "It's no easy thing to make a living in the wilds of Skyrim." She will also sum up the nature of Skyrim itself by telling you that "This land's tough and unforgiving, but beautiful, too." 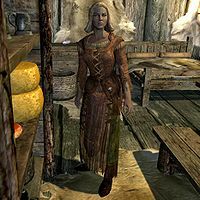 She also shares many of the fears of the ordinary people of Skyrim and she will soon tell the player that "You hear all this talk about a war? I hope it never comes here." She carries a selection of common loot and gold, the key to the family's house, and a simple iron dagger. She also wears a standard set of farm clothes, a pair of boots, and a hat. This page was last modified on 22 May 2014, at 05:45.